Used stair lifts from AmeriGlide and Summit are procured from other home users like you, and are subjected to a rigorous inspection and rebuild process using our original factory checklist. We thoroughly test all pre-owned stair lift units prior to shipping to ensure the safety of our customers. All of our used stair lifts are covered by an unbeatable warranty. For additional information about our pre-owned stair lifts, please contact our lift experts at 1 (888) 301-2610. 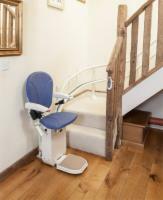 Want to sell your used stair lift? We buy back stair lifts by Acorn, AmeriGlide, Harmar, and Summit! Click here for information on our buy-back process.